If you’re like most arc welders, you’re always looking for ways to improve your weld quality and output levels. Welding wire and electrodes are one component of welding that is often overlooked as a way to improve production, but it might be just the variable you need to consider to achieve your goals. Solid gas metal arc welding (GMAW) wire. GMAW combines a solid wire electrode (GMAW electrodes) with a shielding gas to protect the weld. The wire and gas combination affect weld strength. This type of wire is popular because it leaves slag-free deposits and doesn’t require much clean-up, boosting efficiency. Composite GMAW (metal-cored) wire. Metal or flux-cored wires have metallic components in the core. These are also slagless, low-clean-up choices. Performance is similar to solid GMAW wire. Gas-shielded flux-cored arc welding (FCAW) wire. Fluxing and deoxidizing agents in the core help protect the weld from the atmosphere and can be engineered to affect the mechanical properties of the weld deposit. Dirty Steel. FCAW wire is the most tolerant of dirty base metals, followed by composite/flux-cored wires. Solid wire electrodes just don’t handle mill scale and surface contaminants well, unless the wire is highly deoxidized. Travel Speed. Metal-cored and flux-cored welding wire is the best choice if speed is important. Again, solid wires don’t do well when materials are contaminated which slows down deposition speed and can negatively impact bead shape. Out-of-Position Welding. Out-of-position welding is always a challenge. In these situations, small-diameter FCAW wire is the best choice, allowing high deposition rates and producing slag that can actually help support the puddle. Solid wire and metal-cored wires can be used with a short-arc procedure on thin materials. Pulse-welding can improve deposition rates if you must use solid or flux-cored wires. Mechanical Properties. Both metal-cored and gas shielded flux cored wires provide good strength and mechanical properties. The added core components influence mechanical properties, giving these two types of welding wire advantages over solid metal wires. Postweld Operations. Solid wire and metal-cored wires are cleaner choices since they produce little spatter. FCAW wire requires the most clean-up due to the slag left behind on the weld. In multiple pass applications, you might even have to remove slag in between passes. All gas-shielded electrodes have different mechanical properties, arc behaviour, and intended applications, but that doesn’t necessarily mean you are limited to using the same type of electrode you’ve always used. Options exist for almost any welding project. If you’ve made changes in other areas and still aren’t obtaining the results you want, it’s time to take a look at your welding wire – and Josef Gas can help! 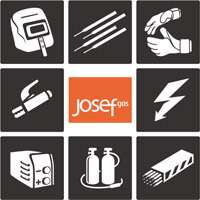 Visit us online at www.josefgases.com or in person at 201 Basaltic Road, Concord, ON to discuss your project needs and find welding wire that will deliver the results you need.